Melt Flow Rate (MFR) and Melt Volume-Flow Rate (MVR) can normally be obtained with easy and quick test procedures. Test standards specify detailed test conditions, including pre-heating period, starting position, and measurement length/time. 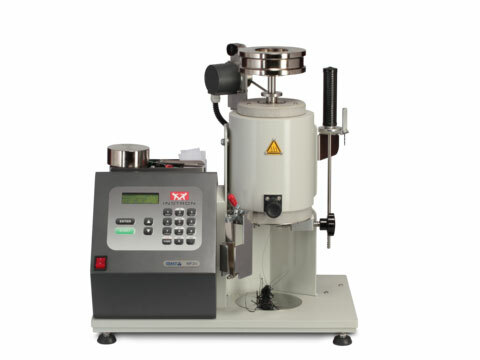 However, when using a basic melt flow tester (extrusion plastometer), fulfilling all standard specifications can be challenging with some polymers and compounds, and results can be affected by poor repeatability. It's not uncommon that during the pre-heating period the sample swells and pushes the piston up, especially when testing under low-load conditions (e.g. less than 2.16 kg). Applying a compacting force higher than the test weight can prevent this from happening, and if precise positioning of weight lifting device is possible, the starting position and timing for measurements can be set in a much more repeatable way. Some samples show very high viscosity and effective compacting requires high loads. Air bubbles trapped inside as a result of poor compacting can affect the MFR/MVR results. A high, but controlled, compacting force is needed. Plus, at the end of tests, the same force can be applied for purging out the remaining material, reducing the total test cycle time. We tested an HDPE sample with an expected MFR of about 0.25 g/10 min (190 °C, 2.16 kg) with a CEAST MF30, applying ISO 1133-2 Procedure B. CEAST MF30 has a load cell integrated with the weight lifting device, giving the possibility to apply up to 750 N of compacting force. To compare the repeatability of results, we performed twenty consecutive tests using the load cell for compacting, and another twenty without (so using only the test weight to compact). The average MFR result was close to the expected value in both cases. However, results from the tests performed without the load cell were consistently higher and with a standard deviation of 0.012 g/10 min (close to 5%), whereas tests where the load cell was compacted the standard deviation was as low as 0.005 g/10 min (2%). Similar results were obtained also following ASTM D1238 Procedure B.